nabi Big Tab HD 20'' by Nabi at The GM Sign In. MPN: BGTAB-NV20A. Hurry! Limited time offer. Offer valid only while supplies last. 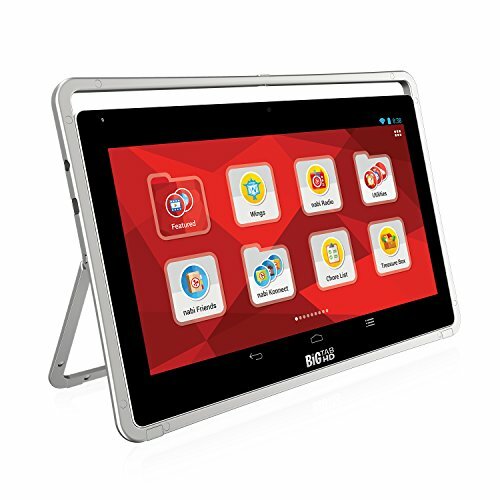 nabi Big Tab HD 20" is the world's biggest HD tablet made especially for children and their families. There's more to enjoy than ever with a massive HD 19.5" display, faster performance and battery for room-to-room portability. With a sleek, removable handle that adjusts to any angle and sits easily on most surfaces, the Big Tab is sure to redefine family time. Everything You Love About A Tablet, But Bigger: The incredibly vivid 19.5", 1600 x 900 HD+ multi-touch capacitive screen lets you experience console quality games and movies in high-definition. Featuring nabi OS 3.0 Blue MorphoTM, nabi Big Tab HD includes over 400 kid-focused, parent-approved features making it perfect for the whole family. Room-to-Room Portability: Watch your favorite movie, browse the Internet or play popular games from anywhere in the house. Its sleek, integrated handle, built-in battery and lightweight design make nabi Big Tab HD perfect for room-to-room portability. Made for the Entire Family: Bring friends and family together for a fun night of playing games. Its large, multi-touch screen - which can prop up or lay flat on a table - creates a social experience that allows everyone to interact and play on the same surface, just like a real game board. If you have any questions about this product by Nabi, contact us by completing and submitting the form below. If you are looking for a specif part number, please include it with your message.